have many flashlight holders to choose from. 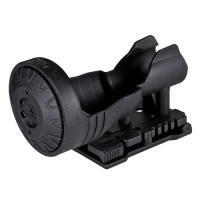 Made specifically for 5.11 Tactical's TPT R5 duty flashlight, this flashlight holder from 5.11 Tactical is made of polymer PC/ABS composite material for a rugged construction that is reliable and can withstand hard use. The TPT R5 holder features a universal belt system that can be adjusted to fit any standard or duty size belt you need to use on the job. With its versatile pivoting design, this polymer holster insures a quick draw that will be smooth and professional!